Some Latin foods don’t need translating anymore. That is the case of churros. Crisp and golden on the outside, soft and almost moist in the center, and covered in a gritty mix of sugar and cinnamon. They have to be some of the most, if not the most, irresistible fritters. Mexicans don’t get the credit for inventing them though. That battle is still disputed between the Portuguese and the Spanish. But we do owe the Spanish for helping churros find their way to our Mexican kitchens, where we have found a way to make them our very own. More than five centuries later, so rooted they have become, it is hard to find a town, small or large, that doesn’t sell them. You can find churros being sold by street vendors in little paper bags, in baskets, or in stands that have a heating light to keep them warm – people tend to underestimate how chilly Mexican nights can get. But there are also churrerías, places that only sell churros and different kinds of hot chocolate to accompany them. Then there are extra dipping sauces that, of late, have become fillings. Some industrial churro press machines pump out churros with an inner tunnel that can be filled with dulce de leche or cajeta, chocolate or fruit jams. I go for the traditionally plain ones, without the inner tunnel, with cajeta or dulce de leche on the side to dip as I please. Just like other extremely popular street food goodies, many people have the misconception that something so good must be impossible to make at home. Well, wrong and wrong. All you need is a good recipe – and my boys and I did the legwork for you – and a churro-making tool. On the recipe, it was a team effort. You know how many takes my boys sampled? The dough was too thick, then too sweet, then too crackly. Or once shaped into churros, it hardened too fast, its center dried too soon and the grooves didn’t stay smooth. Finally, we nailed down the most irresistible and fool-proof one. With the recipe nailed down, the issue became the tool. As the perfect masa needs to be heavy and thick, it resists being pushed around in a cookie cutter or in a pastry bag. Ask my oldest son, he came to the kitchen to my rescue one too many times to help push the dough out from a cookie cutter press, we ended up breaking, and the pastry bag attempts were too much of a work out. I finally caved. Though I am usually one to complain about stores trying to sell you special tools for certain cooking tasks, or for dealing with ingredients that do not require a special tool at all. Take the egg slicer, for example. Not only does it not work, it is messy and it does not make impeccable slices. Or the nutmeg grinder, nothing a normal grater can’t handle. I have to admit, the humble plastic churro press (less than $20 and many brands available online), is a great thing to have if you want fresh churros at home just about any afternoon. Since the dough can be made in just a few minutes, you can have churros pressed and fried, seamlessly in less than a half hour. Hola Pati! Muchísimas gracias por compartir tan generosamente tus recetas. Anoche hice churros por primera vez gracias a tus claras intenciones. Mi pregunta es: ¿Qué hice mal? Pues mis churros sabían muy bien pero todavía tenían un tenue sabor a harina. Trata de batir la masa un poco más para que se mezclen muy bien los ingredientes. Trátalo de nuevo! Me encanta ver tu programa. Me haces recordar de mi niñez, gracias por las recetas especialment los churros! Yo soy de Guadalajara, Jalisco ahora vivo en California donde te adoramos. Me siento muy orgulloza de ser Mexicana y enseñar a mis amigos tu programa en de television. Hasta mi Tia Gladys (Puerto Rico) vive en New York ve tu programa. Uy mil gracias, Patty! Salúdame mucho a tu tia. I am from Michoacan and I see how the basic traditions are getting lost being in another country. My mom can’t even make tamales and I would love to learn my history/culture especially through our food. So when I want to try something I come to your website and appreciate your love of Mexico and sharing it with the world. It is more than just beans and rice. So here I am looking for a churro to make my kiddoes. So thank you y mucha suerte con el futuro! Oh thank you so much Karina! It makes me so happy to know you are passing on the traditions to your kids. I hope you all have lots of fun kitchen adventures! Hola, Pati! We are from Mississippi and are fortunate to be spending Christmas in the Yucatan. We love every minute and every bite. Today I discovered a dessert pastry called Rosca De Reyes which contains a baby Jesus figurine! It reminds me of the King Cake served in New Orleans during Mardi Gras which also is traditionally shaped in a circle and contains a baby Jesus. Whoever gets the baby must provide the next King Cake. Could Mexico be the source of this sweet Cajun tradition?! Oh in Mexico we eat Rosca de Reyes for sure! But we are not the only country to do so. Oh wow! Thank you for being such a loyal fan, Iola! I just recently found your show and I’m hooked! I was wondering if I can make the churro dough and refrigerate it to fry the next day? Thank you! ​Hm. The problem is that then it will harden and be harder to press through. If you refrigerate and then take it out and let it come to room temperature you will have more success. 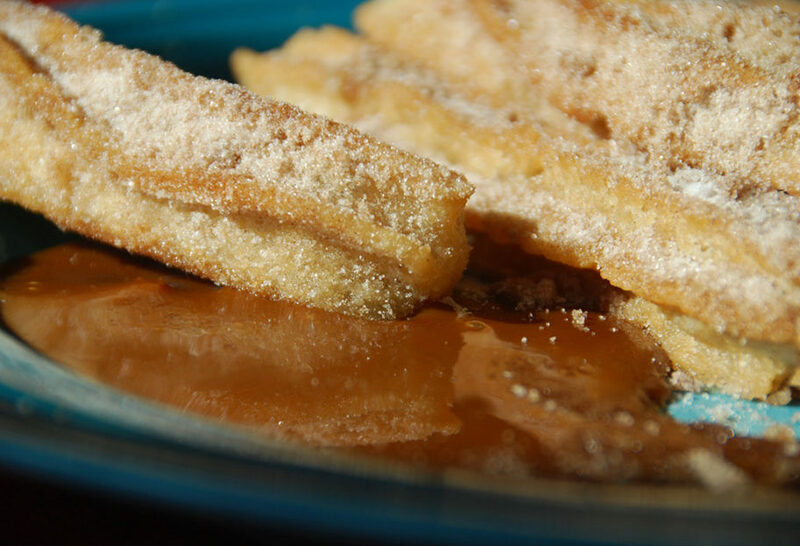 Hola, Pati… i made some churros today using your recipe and they were so good! Thank you for sharing this recipe. To Prepare portion is missing on this recipe. Can you please add it on. Thank you for letting us know Rosalie! When I hit my goal number on the scale, I am going to reward myself with an occasional treat, and this is one of them! In the meantime, I have been feasting my eyes on your foods – thank you. By the way, the link for your cajeta isn’t working. Thank you for sharing Jayme! Love your show and always look forward to see every week. follow you through in the simplest way. More success in your show and endeavor in life. churros recipe, and notice most recipes call for butter instead of oil. Is there a reason why you prefer the oil over the butter when cooking the dough? Pati! You are still the best!! Well tried the churros but they too wet not done enough inside, 4 to 5 minutes left 1 or mjnutes still uncooked, oil 350 degrees, what did I do wrong? I &my husband Richard enjoy your show very much &have trie a few recipe s but do cook mexican food start off always with tomatoes&onions con garlic. Your familia is precious, bless you. Thank you, Mary! Hope you like the Churros. this one would be the one and only churro recipe I’d stick to for the rest of my life! I am looking forward to trying the churros. My 4 year old grandson spent a week with me in Isla Mujeres and we had some crispy on the outside, soft on the inside churros. Loved them. I wanted to say how much I look forward to your shows. I love how much you love the food and how lovingly you describe the cooking. I also love that you actually eat and enjoy your food. Thanks for a great way to spend Saturday mornings on PBS. Hi Sandra, Thank you so much for watching and for taking a minute to write to me! We eat this food all the time in my home, and it is my pleasure to share it with you. 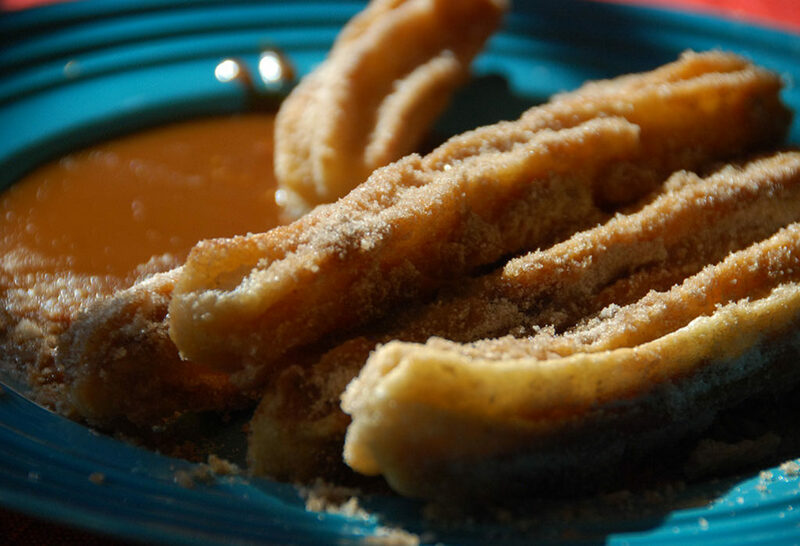 I hope the churros live up to the ones from Isla Mujeres…you will have to let me know! I love this show!! I learn a lot and look forward to trying some of your recipes. I seen this episode, but I can’t seem to find the caramel sauce recipe you made in the copper pot. I love Churros! I get them every time I go out and now thanks to you I get to make them on my own! Thanks so much for sharing this recipe. It calls for vegetable oil for frying plus 1/4 cup, then it only calls for 2 tablespoons to go in the dough. Is that right; just 2 tablespoons? Thanks for noticing and I corrected, it is 1/4 cup oil, thanks Karen! Thank you for sending me this email about churros. I am always excited to try your recipes. They are all very good. I thought the authentic churro had queso fresco finely crumbled in the batter. Is that correct? Well, not that I know of, Thomas. But that sounds tasty! Made them tonight and were easy and delicious! All of the other churro recipes that I’ve seen are made with a cream puff dough. Basically the same but with eggs. I guess they aren’t authentic. I can make these when I have a sweet tooth but no eggs! Thank you Pati.. Thank you Pati. Lol I made them with the 2 tablespoons and they weren’t that good. Texture and density was wrong. I will try again with the 1/4 cup. I only made a half of a batch since I wasn’t sure.